So as some of you know, my son bought Matt's foxbody coupe last year as a project car. After a winter/spring of little action, we finally started making progress. We're getting really close to being ready for paint/body. Judging by your fastback, I know this is going to be one clean Fox! Did you decide what motor and Trans combo yet? No decision on drivetrain yet. On a related note, there is always that one bolt. Took forever to drop the k-member yesterday thanks to one stubborn bolt. It did come off in the end though! Vice-Grips FTW. I'll try to get some pics up later this week of the progress. Can't wait to see the progress, Brodie! Keep us posted! Good luck with it...Im probably more anxious than anyone in here to see where it goes and its long road away from and maybe, never know, back to my garage LOL. Keep it up and more than anything i hope yall both have a good time on it together! Yeah. This is the father son moment every boy dreams of. I just got to say, you're an awesome dad, Brodie! Body work, what little was needed, completed and the car is in primer. Now the fun part, sanding in preparation for paint. Of course, we still have the hood, doors, trunk lid, front bumper cover and rear bumper cover left to prep and prime. Nice! Y'all are making good progress! What color have y'all chosen to paint it? 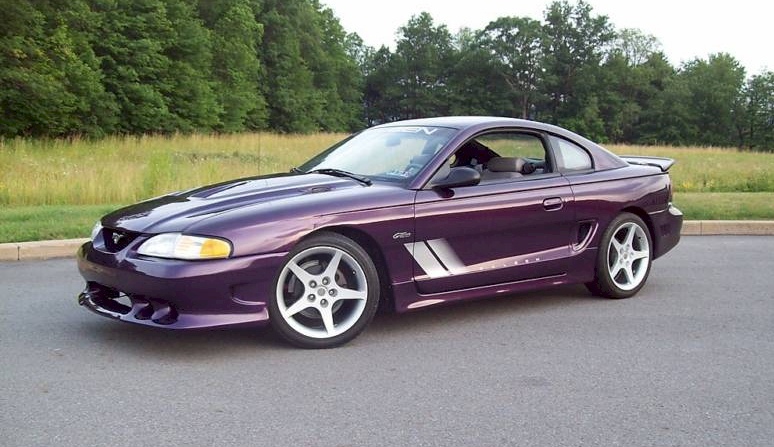 Ford race red or deep violet clear coat metallic. Sonic Blue or Dark Shadow Gray. Ehh, Sonic Blue is looking old to me. Old picture of my junk when clean. Looks like this when a bit less clean (can't see metallic so well). He says he wants black. I've told him while it would look good in black, keeping a black car looking good requires a lot of work. If he does end up going with black, we'll look to do some things to the car to set it apart from every other black fox notch. Just how and where would be the question - to be different. Dad definitely needs to practice his painting skills before we tackle the full car. Not happy with the amount of orange peel. Please tell me thats not a Chevy color. It is absolutely NOT a Chevy color. Picture does not do it justice. It is a metallic orange. Besides black, the other color being considered, and it would be my pick if it were my car, is Sterling a Grey Metallic. I'm liking it. You don't see too many metallic orange Fox Mustangs running around (especially since there never was a production orange Fox). You will get the painting down Im sure, or you will get really good at sanding LOL. Look forward to seeing what color he picks but outside of going back with the original color I think a Metallic Grey would be really cool! After spraying one car with metallic paint I learned that I did not know how to spray metallic paint. I think I determined that the thickness of paint application determines the depth at which the metal sits. Too thick and the metal settles to the bottom, too thin and it all sits on top. Thus, my purple car had darker/no metal areas and lighter/all metal areas. You may already know that, I just don't want anybody to make my mistake. Thanks for the info. Now that the piece has been color sanded and buffed, it looks great and the metallics in it are about what I expected. Moving right along now. All but the front and rear bumper covers are prepped for paint. Hoping to have everything ready and in color by the end of September. My friend, Steve Longacre, did this professional render of what we hope the car will look like if we do our part effectively.